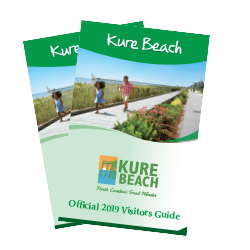 Shopping in Kure Beach offers your pick of authentic keepsakes and special treasures. Track down the perfect custom tee at a fun shirt shack or beach souvenir at the Kure Beach Fishing Pier. Find aquatic-related items in the North Carolina Aquarium at Fort Fisher gift shop. Comb through the local surf shops or browse stores along the Carolina Beach Boardwalk nearby on the island for everything you need for a day on the beach.